Sugar cookie bars is a quick and easy holiday recipe that even the kids can prepare. Store bought sugar cookie dough is pressed into a pan and baked. It is topped with chocolate and candy melts in an assortment of colors to makes these cookies fun and festive. These are great for holiday parties or a quick treat for the kiddos. Step 1: Heat oven to 350°F. Line 9-inch square pan with foil, leaving enough to hang over edges of pan. Spray bottom and sides of foil with cooking spray. Press cookie dough evenly in bottom of pan. Bake 28 to 30 minutes or until edges and center are set and light golden brown. Cool 5 minutes. Step 2: Meanwhile, in small microwavable bowl, microwave chocolate chips uncovered on High 45 seconds; stir. Continue heating for 15-second intervals until mixture can be stirred smooth. Stir in peppermint extract. Spread on top of warm cookie base, spreading to within 1/4 inch of edges. Step 3: In two separate small microwavable bowls, microwave candy melts uncovered on Medium (50%) 1 minute; stir. Continue heating for 20-second intervals, until candy melts can be stirred smooth; transfer to 2 separate small resealable food-storage plastic bags. Cut small corner off each bag, and squeeze teaspoonfuls of alternating colors onto melted chocolate layer. 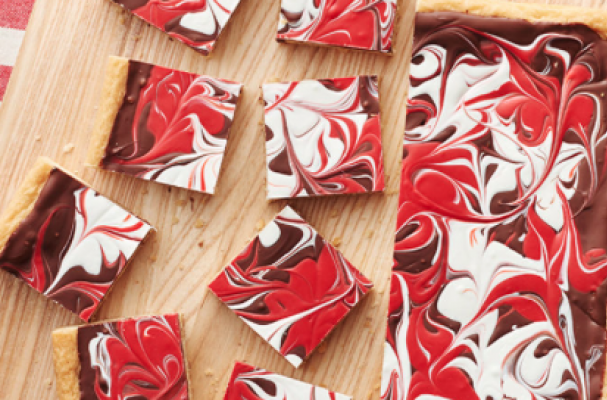 Using knife or metal spatula, cut through melted chocolate and candy melts to create swirled marble design. Firmly tap pan on counter to create a smooth surface. Step 4: Allow bars to cool completely, about 2 hours or until chocolate topping is set. To serve, remove bars from pan, and cut into 4 rows by 4 rows.